We strive to breed for the Big, Bold & Beautiful look. A German Shepherd that fits right in with the family environment. 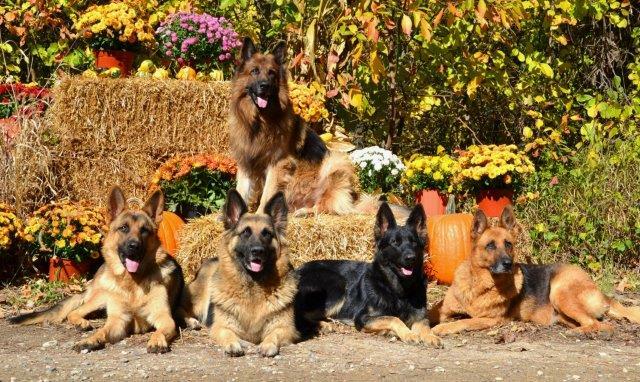 German Shepherd breeders in the United States. Planning 2019 litters NOW, get your applications & deposits in to hold your puppy. When contacting me, be persistant ! dont be offended if I dont get right back to you, call/email again. As I put my dogs first, paperwork & emails get squeezed into my days. There is a passion to our breeding program here, to preserve the old, pure bloodlines. I've continued to research the GSD bloodlines and strive to breed for the Big, Bold & Beautiful look, with sound mind and body. The German Shepherd dog fits right in with the family environment, that is why my husband & I love them so (we had Shepherds before & during the time, the kids were small). I searched for the German Shepherd I remembered as a child, the one that would play with us in the yard & protect us from strangers. A Shepherd that was squarely built, with muscle front & back, with a very slight angulation and a pretty head, and a huggable personality. Our dogs are observant, obedient and a pleasant member of the household, quiet in their own environment, especially with children and other animals, and at ease with adults. Overall, they present a harmonious picture of innate nobility, alertness and self-confidence. We breed for a medium energy/drive, straight backed dog to fit into the family environment, with temperament to be a Good Canine Citizen, to do therapy work and totally trustworthy with our most prized possessions, kids & grandkids. I carefully screen all potential puppy buyers and require a huge amount of information before deeming them an acceptable home. Yes, even for "pet quality" puppies. I have and will refuse a sale, if I do not think the person would make a good life-long home for the pup. Starting with a 2 page application, then I call and visit local applicants and for non-locals, I google their address to see location and neighborhood. I offer a 2 year written hip and temperament guarantee. After Application is approved, a non-refundable, but litter transferable deposit of $200 for a puppy is required. I will NOT sell 2 puppies at the same time to the same family. Or sell a puppy into a family that already has a puppy under 2 yrs old. again this year. 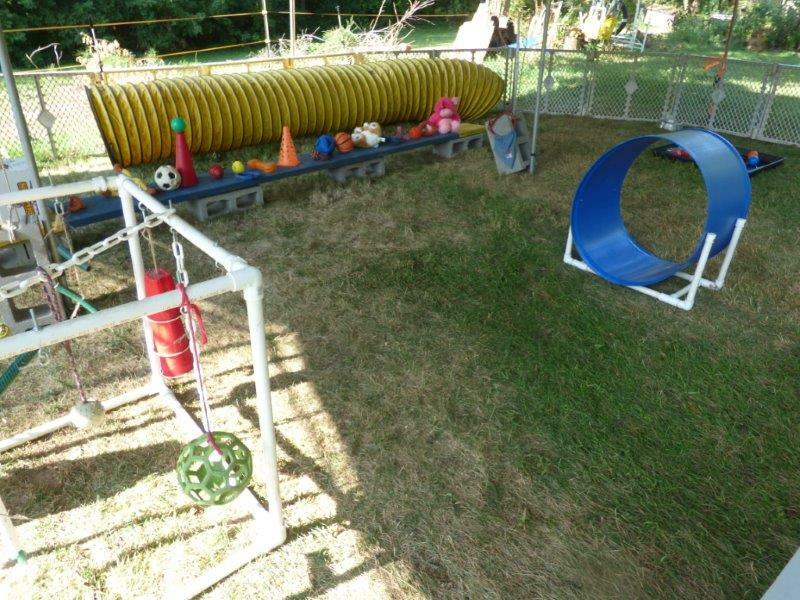 Games & Agility course will be ready for your dog(s) to play on. Starts in Milfords Central Park near the tennis court, then we walk through Milford for approx 1 hour. What Does "Naturally Reared" Mean ? meaning no commercial flea or tick chemicals. This also means that our dogs and their pups are raised inside our home, in a pack environment (with their siblings and other dogs as they are older), on clean ground (their huge outside puppy play pen), and by having plenty of free access to fresh air, sunshine, clean drinking water, and room for lots of exercise! Our dogs & their puppies are raised on a species appropriate diet of raw meat, raw bones and raw organs. this includes grains, fruits and veggies - all dogs are carnivores! We follow the "natural prey model" of feeding our dogs and pups! I temperament test puppies at 7 weeks of age, to know the puppies energy, drive and personality, to make recommendations to help match the puppies personality with the right family. The ultimate goal is fitting the puppy into the right environment where it is to be placed. Puppy buyers choose their own puppies based on photos, temperament test results, energy and drive, observed in the litter. I do not choose puppy for buyers, but do make recommendations from the information on the application and many conversations before puppy goes home. I always reserve the right to deny the choice, if the choice is not the right puppy for the environment. Puppy is sent home with a toy/towel with the litter mates and moms smell on it, a comforting scent, to help get thru the first couple of nights. Also a printed weight chart since birth, a weekly diary of its first 8 weeks of life, 4-5 generation pedigree, results of temperament testing, micro-chipping paperwork & tag and AKC application to register puppy. Buyer will also offer Breeder/Seller first refusal of puppy if ever he/she is for sale. by phone, email or face to face. 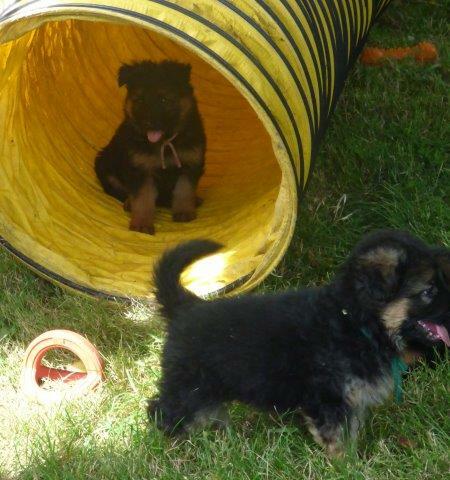 Puppies are socialized with toys & tunnels, with other pack members, horses & farm noises before going home at 8 weeks. 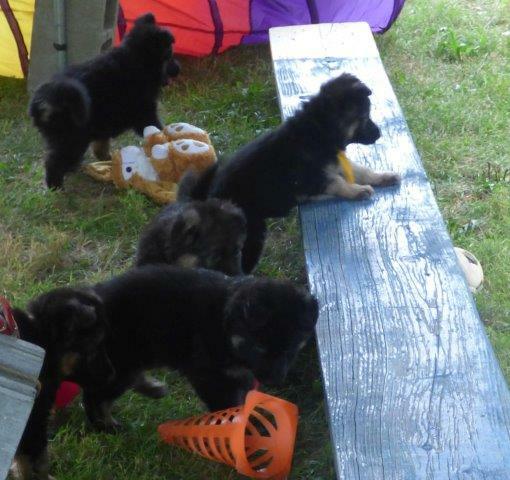 And this is how a great GSD breeder keeps her puppies happy till they go home at 8 weeks. And this also shows how important mental stimulation is to a German Shepherd, because they are a thinking breed. We Feed a Natural Raw diet here at Hanabrit. Why we Feed a Raw Dog Food? How much do you really know about your dog’s food? And why is everybody feeding a kibble-dry manufactured dog food ? Why does your vet strongly recommends you to feed your dog dry commercial food. Dog food companies have a clear, economic interest – selling their products. They have amazing advertising strategies and they have conquered every single corner of the market. They offer considerable discounts to breeders who sell their products, they are the main sponsors of dog shows, they hire high profile people, including vets, to talk about and recommend their products. 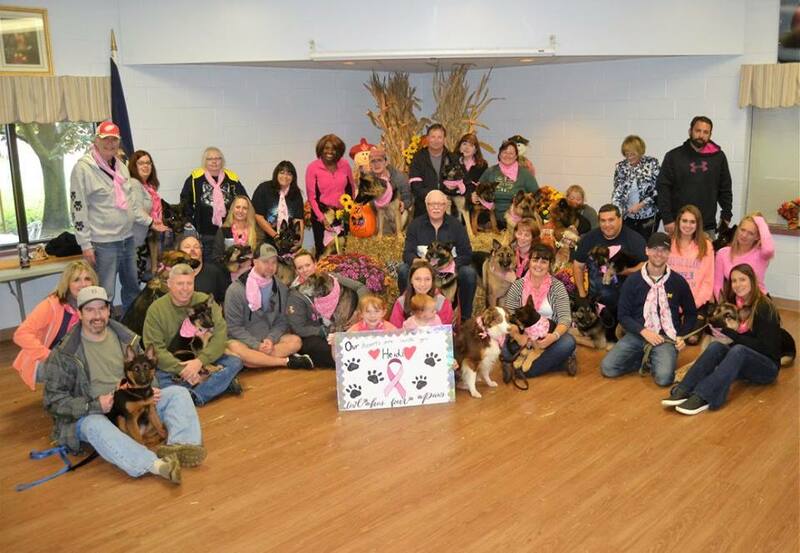 Most Vet Associations are sponsored by pet food companies! Just take a look at the American Veterinary Medical Association or the Australian Veterinary Association. Why would they recommend something different if their money comes from dog food companies? Moreover, feeding dry commercial food to dogs usually causes digestive problems, as canines have a shorter intestinal trac than us humans and you'll end up paying an expensive visit to your vet. I’m not saying vets wants your dog to be sick, but they are surely interested in having as many patients as possible, foot traffic equals money in their pockets. So, forgive me if I doubt most vet's ethics, but I am convinced that even if they were aware of the dangers of commercial food, they wouldn’t tell you. They would avoid losing both their sponsorships and their patients. Now, going back to dog food, one alternative you should really consider is species appropriate dog food, raw meat diet. The raw food diet for dogs focuses on feeding raw meat and eliminating any processed or commercial dry dog food. Find a local Co-op for Raw dog food, even less expensive buying in Bulk. The chewing required by raw meaty bones prepares the stomach for proper digestion; Your dog will stop smelling like a dog! Cleaner teeth and gums, no tartar, less dental treatment. Less digestive problems – dogs don’t eat grains (contained in most commercial foods) and their digestive systems simply can’t handle these foods. Less visits to your vet (less bills). Dogs live longer healthier lives on a raw diet than dogs on commercial foods. You pay less. You may be under the impression that feeding raw can affect your budget, but if you come to draw a line, taking into account the vet’s bills and the fact that the so-called high-quality premium dog foods are very expensive, you might realize that a raw diet is far cheaper. Dogs are carnivores, they need protein, its that simple. Feeding your dog pure ingredients which are easily digestible is the ultimate way to go for your pet’s overall nutrition. Since you know now that dogs CAN'T digest grains and starches and that they CAN digest protein, starting a healthy raw diet should be easy. increase or decrease portions based upon the age & health of your dog. How to calculate: if your dog weighs 70lbs in order to maintain weight calculate 70 x .025=1.75lbs PER DAY, for 2 portions divide by 2. Remember to adjust accordingly. Medford meats Co-op is where we get our puppy & adult raw diet from, if interested, contact me. Flea & Tick preventative; I will not use spot on's or chemical insecticides on adults or puppies. There are many natural alternitives. .....long life starts with eliminating insecticide use. We apply holistic options like essential oils & herbs instead of chemicals on or in our dogs. ask us how to choose healthier options for your furkids. Been using these products since 2008, please use our code when ordering 61208. More than mere vitamins, NuVet� goes beyond industry standards by using natural, human-grade ingredients that are microscopically tested for purity and potency. We then utilize a FDA registered laboratory for formulation and specially compound using state-of-the-art manufacturing techniques. to provide to all my puppies. NuVet Labs™ main purpose is to help increase your pet’s longevity and quality of life. 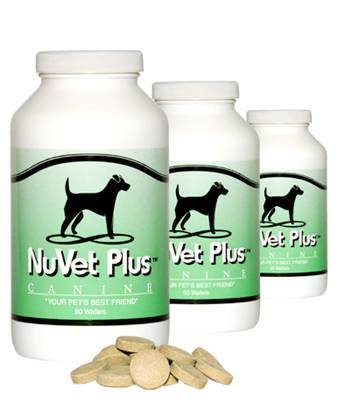 Our products, NuVet Plus™ for Canines and NuVet Plus™ for Felines, provide the very best human-grade, natural ingredients available and utilize the latest advances in medical, veterinary and nutritional science. We pledge to adhere to the highest standards in products and services. Our goal is to maintain a lasting and caring relationship with our family of NuVet Plus™ customers and their pets they love. Insider’s Secret: Thousands of the nation’s top breeders use NuVet Plus� to keep their puppies, kittens, breeding females and males so healthy! MONEY BACK GUARANTEE – Call now to order this revolutionary product. If this isn’t the most incredible pet supplement you’ve ever had, we’ll give you your money back! Medford meats Co-op is where we get our puppy & adult raw diet from, if interested, contact me, or go to Our Facebook Link . I guarantee hips and temperament in writing as long as you DONT spay or neuter your pup until age of two years. All puppies Micro-chipped, vaccinated & de-wormed before going to new homes. I will not use spot on's or chemical insecticides on adults or puppies. In tests of learning, stimulated pups were found to be more active and were more exploratory than their non- stimulated littermates over which they were dominant in competitive situations.). Pups are wormed twice, micro-chipped and vaccinated before going to new homes. Puppy is sent home with a toy/towel with the litter mates and moms smell on it, a comforting scent, to help get thru the first couple of nights. Also a printed weight chart since birth, a weekly diary of its first 8 weeks of life, 4-5 generation pedigree, results of temperament testing, micro-chipping paperwork & tag and AKC/UKC application to register puppy. The standard of the German Shepherd Dog has changed very little from the original written by von Stephanitz in 1899: "to breed Shepherds is to breed working dogs." What follows is the standard of the World Union of German Shepherd Dogs (WUSV) that was established under the auspices of the SV. There has been a movement toward greater uniformity in the standard. There is still nothing that will help you decide what the length of croup should be, or whether a dog is over-angulated in the rear. Keep in mind that the original use of the German Shepherd Dog (GSD) was that of a herding dog, and required that the structure was necessary to trot with ease and endurance. Since it acted as a mobile fence to keep the flock away from adjacent crops in a largely unfenced countryside. Because of this, it had to move at a relatively fluent, even pace, with a minimal wear and tear on the dog's physique. The Shepherd also had to be able to stand for a reasonable time without tiring. The body weight must be correctly distributed and supported by his limbs. Any weakness in the ligaments and joints force the body to compensate and consequently lead to a loss of endurance must be faulted. Neutering, and the age at which a dog is neutered, may affect the animals risk for.. Your dog BEGS you to learn what vets know about bone cancer, hip dysplasia, urinary incontinence, hypothyroid, obesity, and diabetes in spayed & neutered dogs. 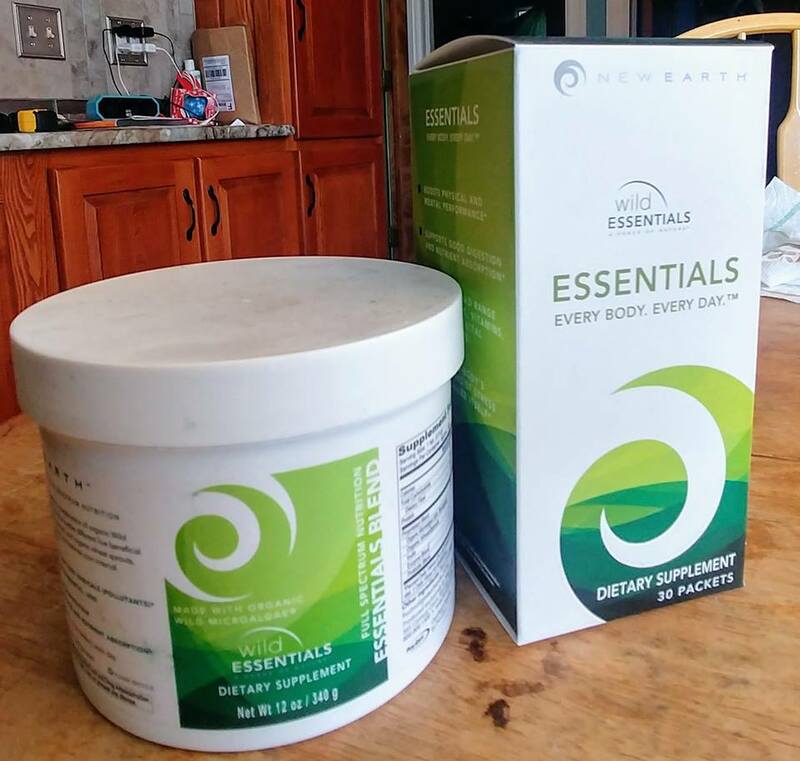 Jim & I have been eating New Earth Blue Green Algae products ; quality nutrition for 25 years. If you want to hear our story regarding this super food, please contact me. It has helped many family members & friends with simple things as heart burn, hang overs, indigestion, ear infections and even strengthening emmune systems to fight & win against cancer. New Earth; The Real Deal. No Compromise - Our company and culture grow directly out of the values inherent in our core products. Authenticity. Excellence. Legacy. After all, algae and fungi are no fad or pop nutrition trend. They are the real deal, the original superfoods. They've been here since the beginning of life on earth. We take those values as our own. Our no-compromise stand on the quality and integrity of our products extends to everything we do, from our multimillion-dollar manufacturing facilities to our videos to our customer service. Here at Hanabrit German Shepherds we feed NuVet to all our dogs, even to the puppies ! The senior dogs get NuVet extra joint health. We feed ONLY a raw natural Prey drive diet of meats/bone/organ to our dogs. Puppies & parents are raised on a species appropriate Raw diet. Research /google Dr Karen Becker for video explaining why a Species Specific diet is recommended. Zignature, Taste of the Wild PREY or Victor are good kibble choices, but have not fed kibble here for 6+ years. The Dog Food Project Site! The above link is an awesome resource in understanding the current controversy and ingredients inside most brands of available pet dog food. So much has changed so rapidly in the area of canine nutrition, and continues to do so. Some insist BARF is the safest way to go in light of all the controversy. We Feed a Natural Raw diet - If one must feed a dry manufatured kibble, we suggest a HIGH quality kibble such as Breeder's Choice Pinnacle or Taste Of The Wild and recommend you do your homework and provide a quality diet to avoid a host of issues poor nutrition can cause. In light of the horrors of last year's recalls, we know any old kibble won't do! For those not convinced by the fact that there is not a single tooth in a dog's head meant to grind grain possibly being a good reason to consider grains may not be the best primary protein source, or for just insuring optimal vitality, we recommend NuVet, an excellent supplement, digestive enzymes & coconut oil & fish oils.